One of Hackney’s most prominent street paintings could be obliterated by the council. In late September environmental officers ordered the owners of a shopfront at 203 Hackney Road to remove a 12ft rabbit painting on its wall. The graffiti is the work of renowned Belgian artist ROA, who has been creating complex and imaginative paintings of animals on buildings across Europe and New York and has recently won a commission in São Paulo, Brazil. 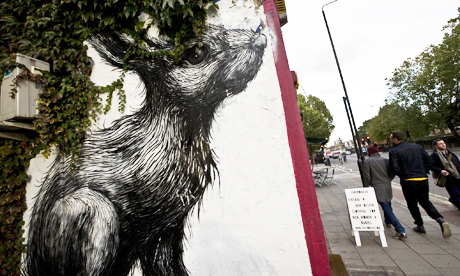 “People are constantly passing by, taking photos [of the rabbit] and street art is one of Hackney’s important features that many people visit the borough to tour,” said Julia Craik, the managing director of the Premises recording studios, which owns the shopfront. “Hackney Council describes it [in the removal notice] as ‘a blight on the environment’ and ‘detrimental to the amenity of the area’ when quite clearly it is the opposite,” she added. Ms Craik said getting planning permission is time-consuming and costly, adding that “it is a very deceitful way of making money”. The deadline given to the Premises to remove the graffiti expired on 14 October. The council now reserves the right to paint over the wall at the property owners’ expense. The council spokesperson did not answer the Citizen’s question about whether enforcing graffiti legislation remains Hackney Council’s priority in the light of severe the funding cuts it faces. Haggerston councillor Ann Munn did not reply to an email seeking her view on the rabbit graffiti removal. ROA, who exhibited at Shoreditch’s Pure Evil gallery earlier this year, in a recent interview has singled out authorities in London along with Barcelona as the most graffiti-intolerant in his experience. In 2009, Hackney Council removed a painting of the royal family by the world’s foremost street artist Banksy from a building in Stoke Newington despite local opposition. To object to the removal of the Hackney Road rabbit, contact Neighbourhood Enforcement Officer Gaynor Brown by filling out the council’s graffiti online form.